A simple goiter is an enlargement of the thyroid gland. It is usually not a tumor or cancer. This image shows enlargement of the thyroid gland and extension down behind the breastbone (retrosternal space). 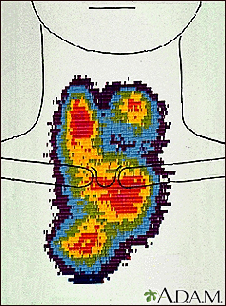 The image, called a scintiscan, was generated using a radioactive isotope. The thyroid gland, a part of the endocrine (hormone) system, plays a major role in regulating the body's metabolism. The thyroid gland is an important organ of the endocrine system. It is located at the front of the neck just above where your collarbones meet. The gland makes the hormones that control the way every cell in the body uses energy. This process is called metabolism. Iodine deficiency is the most common cause of goiter. The body needs iodine to produce thyroid hormone. If you do not have enough iodine in your diet, the thyroid gets larger to try and capture all the iodine it can, so it can make the right amount of thyroid hormone. So, a goiter can be a sign the thyroid is not able to make enough thyroid hormone. The use of iodized salt in the United States prevents a lack of iodine in the diet. The main symptom is an enlarged thyroid gland. The size may range from a single small nodule to a large mass at the front of the neck. Some people with a simple goiter may have symptoms of an underactive thyroid gland. The health care provider will do a physical exam. This involves feeling your neck as you swallow. Swelling in the area of the thyroid may be felt. If you have a very large goiter, you may have pressure on your neck veins. As a result, when the provider asks you to raise your arms above your head, you may feel dizzy. If nodules are found on an ultrasound, a biopsy may be needed to check for thyroid cancer. A goiter only needs to be treated if it is causing symptoms. A simple goiter may disappear on its own, or may become larger. Over time, the thyroid gland may stop making enough thyroid hormone. 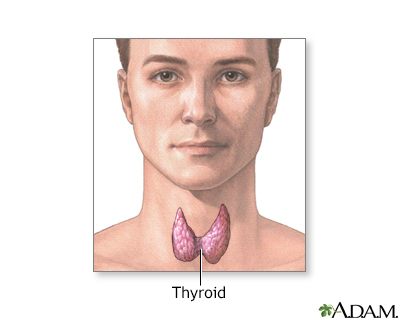 This condition is called hypothyroidism. In some cases, a goiter becomes toxic and produces thyroid hormone on its own. This can cause high levels of thyroid hormone, a condition called hyperthyroidism. Call your provider if you experience any swelling in the front of your neck or any other symptoms of goiter. Using iodized table salt prevents most simple goiters. Hegedüs L, Paschke R, Krohn K, Bonnema SJ. Multinodular goiter. In: Jameson JL, De Groot LJ, de Kretser DM, et al, eds. Endocrinology: Adult and Pediatric. 7th ed. Philadelphia, PA: Elsevier Saunders; 2016:chap 90. Kim M, Ladenson PW. Thyroid. In: Goldman L, Schafer AI, eds. Goldman-Cecil Medicine. 25th ed. Philadelphia, PA: Elsevier Saunders; 2016:chap 226.